Make your very own armor! Do you want to be a Samurai? Join local high-school students and other foreigners in group capture the flag battles with spears and armor! Come individually or make your own team! There will also be horseback riding, taiko drumming and traditional dancing! ２．If it is judged that I have difficulty in continuing the competition, I will obey the instructions of the Samurai festival committee promptly. In addition, I will also obey the instructions in safety management and the samurai festival administration. ３．If a sickness or wound occurs during samurai festival battles , I do not have an objection to be treated temporarily. I do not hold the sponsor/committee accountable for the method and process. ５．I agree to compensation for any accident, sickness, or wound incurred during the Samurai Festival limited to the amount allotted by the insurance provided by the Samurai Festival. ７．I entrust the use of my image and appearance in any festival photograph or video to the Samurai Festival executive committee. I abandon the personal rights. The sponsor/committee recognizes the importance of personal information and adheres rigidly to a law about the protection of the personal information and laws and ordinances concerned. To improve our service for samurai festival participants, we keep personal information for a notice of record and announcement such as posters, flyers, HP and press releases, etc..We may contact you for confirmation about the application contents. 1. The victory is that one team has killed the other team‘s general. 2. Three rounds of battle will be performed, and overall victory is determined by the number of times that a team kills a general. 3.Fighting is done only using a spear. A stab in the torso, not to the head and neck, is considered defeat. 2. We will have 4 assistant referees to assist Chief referee. 1. One platoon is composed by minimum 5 up to 7 people. One battalion is composed by 5 or more platoons. 3. The defensive team will protect the general. 1. The battle starts with the conch shell horn and is finished with the conch shell horn. 2. Chief referee can give an order for the stop of the battle anytime if necessary. 3. The battle would be stopped or restarted by the conch shell horn or a whistle. 1. 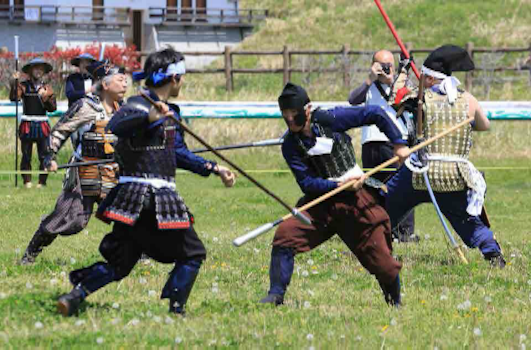 You can only use the spear which the Samurai festival committee has approved or provided. 1. The participants must wear protective armor at all times. 2. The participants must wear a soldier's hat or a helmet protecting the head. 3. Each person is free to wear anything under the armor. 4. The footwear should be straw sandals (waraji) or socks with sole (Jikatabi). 5. You may wear work gloves or other non-slip gloves for protection of one’s hands. 1.The spear should be used only to hit with the tip or to defend with tip or handle against the opponent’s spear. 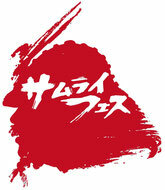 All other uses of the spear, such as hitting other’s heads and neck, is prohibited. 2. Through intention or accidental occurrence, you will be removed immediately if you attack the face, the head, or throat. 3. One-handed stabbing with the spear is prohibited. 4. Bare-handed attacks such as throws, joint locks, or choking techniques are prohibited. 5. Attacking a soldier who is falling and incapable of self-defense is prohibited. 1. A death in battle is judged by a stab or chop with the spear to the armor trunk, not to the heads or neck. 2. Chief referee determines casualties and tells person who break the battle rules of the preceding article to leave the field. In that case you must obey. The soldier ordered to leave cannot participate in a subsequent fight. 4. The battle field is marked by the tape、if you are outside of the tape, you are consider as dead, your fight is over. 5. The death of a general marks the end of a battle. 6. When one fight continues more than ten minutes, the battle is over and the victory will be determined by the greater number of Samurai left alive. 7. As for the one to one combat, a general can appoint other soldiers to fight in his place. 8. 3 battles and one on one battle, the team who win most is the winner. 1. The battle time is ten minutes Each battle is followed by a break for water. 2. Chief referee sets the battle time for last inning. 3. When the victory or defeat is not determined before the last inning, extra battle time will be given after a break. 4. When victory or defeat is not determined by extra battle time, it is decided by one to one combat between generals. The general can not appoint other soldiers to fight in his place.